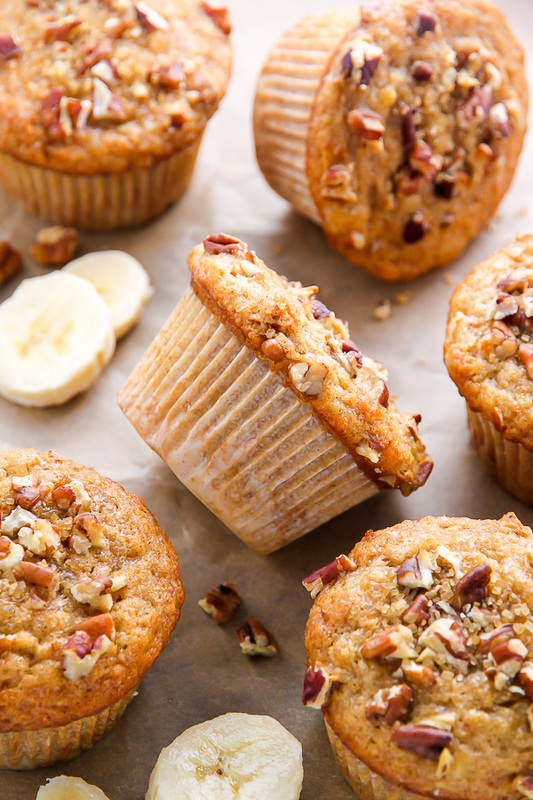 There’s nothing like biting into a fresh-baked maple pecan banana muffin! Easy, simple, homemade goodness in less than 30 minutes. 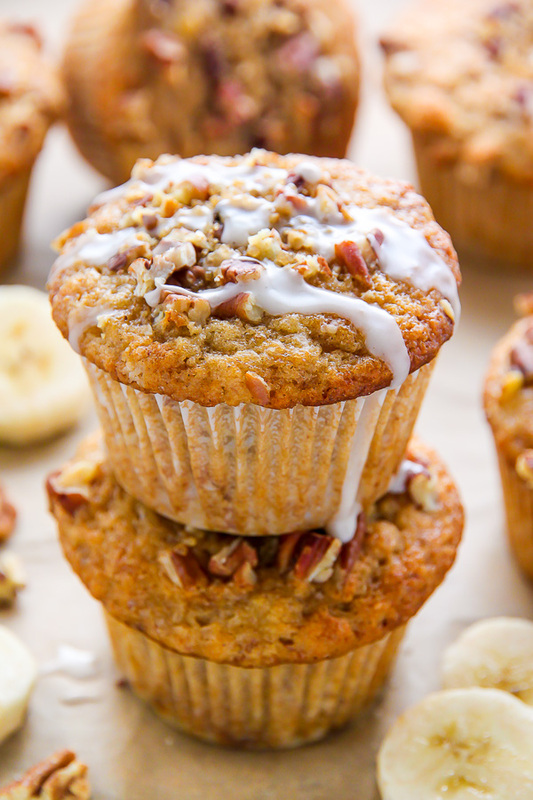 These maple pecan muffins are a hit with the whole family! Although I don’t live a dedicated vegan lifestyle, I do LOVE vegan baking. In the past month I’ve shared with you my favorite morning glory muffins, tropical banana bread, and the most wonderful chocolate chip cookies… all of which just happen to be vegan. ← But by taste, you would never even know it. They’re all so perfectly delicious!!! 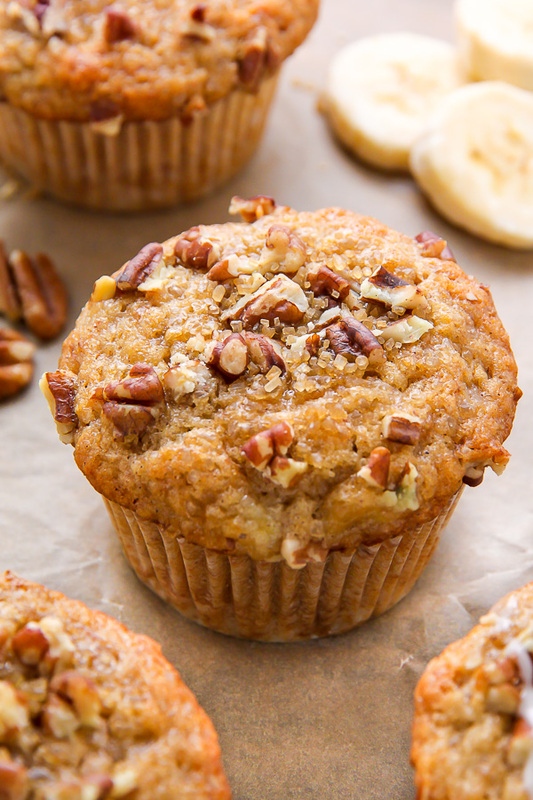 Today I bring you a new vegan recipe to rock your world: Maple Pecan Banana Muffins. Yes, indeed. I’m on a roll! 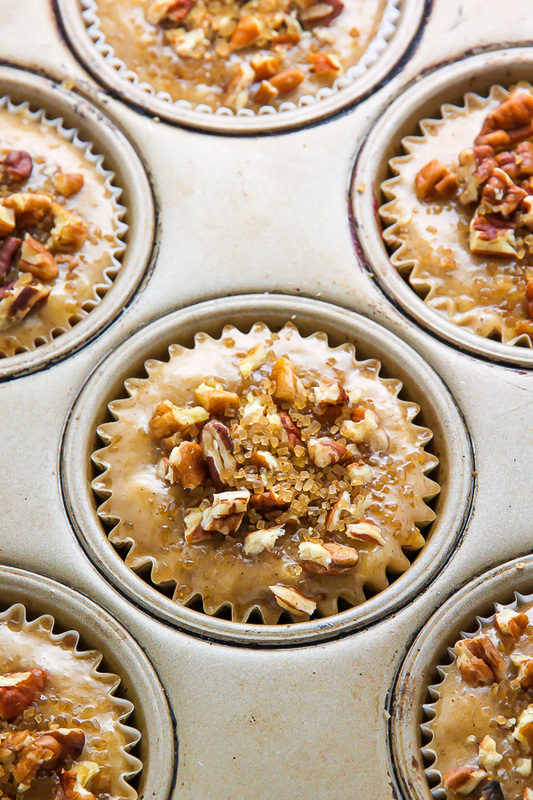 But less about me, more about this maple pecan muffins recipe! They’re sweet, fluffy, moist, and bursting with maple banana flavor. A hearty handful of chopped pecans add a pleasant crunch. 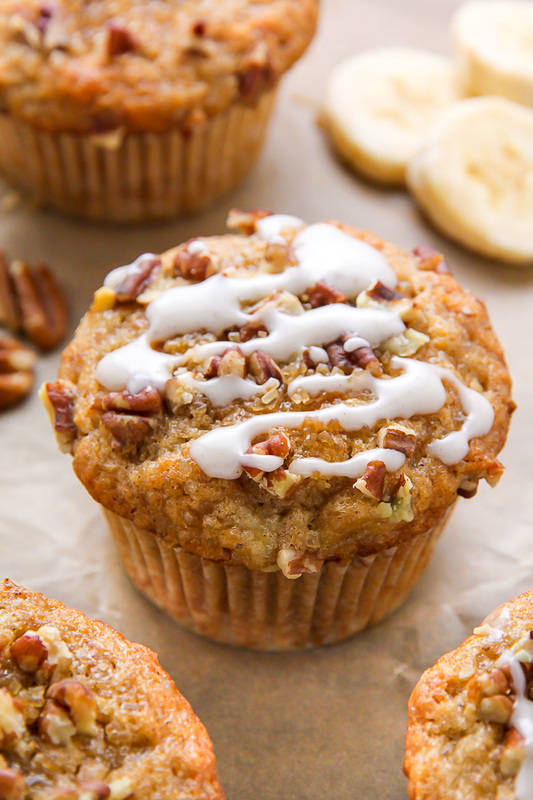 I topped each muffin with extra pecans and turbinado sugar, which adds sparkle and crunch. Sparkle and crunch always get my vote! So let’s get down to business! For these muffins you’ll need flour, brown sugar, baking powder, salt, cinnamon, nutmeg, coconut oil, almond milk, vanilla extract, maple syrup, pecans, and mashed bananas. This recipe calls for 1 cup of mashed banana. I find this is about 3 small bananas, or 2 larger ones. I recommend measuring the mashed mashed banana mixture to be sure you have exactly one cup. The muffins pull their moisture from the bananas, so it is important there is enough. Also, make sure your bananas are SUPER ripe and mushy. My mom has been preaching “black bananas make the best banana bread” since I was a tot, and you guys, it is SO true. I use coconut oil in this recipe because it adds wonderful moisture and leaves just the slightest coconut taste. The coconut oil must be brought to room temperature before using it in this recipe. To liquify, you can melt it in the microwave, on the stove top, or by running the jar of oil under warm water for a few minutes. This is the coconut oil I use. If you are allergic to coconut oil, cannot access it where you live, or simply do not like it, feel free to use canola or vegetable oil in its place. The almond milk may be replaced by cow’s milk, soy milk, or coconut milk. Be sure to spray the paper muffin liners lightly with non-stick baking spray. This really helps them peel right off. The muffins will bake for about 18 minutes, or until they’re fully cooked through. If your oven is not calibrated, I recommend starting to check the muffins around 15 minutes. They’re ready when a toothpick inserted in the center comes out clean. Preheat oven to 400 (F). Line a twelve-muffin tin with paper liners; lightly spray liners with non-stick baking spray and set aside. In a medium-sized bowl mix together the flour, brown sugar, baking powder, salt, cinnamon, and nutmeg. In a separate medium-sized bowl, whisk together the mashed banana, almond milk, coconut oil, vanilla extract, and maple syrup. Pour the wet ingredients into the dry and mix until just combined, being sure not to over mix. Fold in pecans. Divide the batter evenly among the prepared muffin liners. Sprinkle each top with a tablespoon of chopped pecans and a tablespoon of turbinado sugar, if using. Bake for 18 to 20 minutes, or until a toothpick or cake tester inserted in the center comes out clean, or with just a few moist crumbs attached. Drizzle with glaze right before serving, if using. Serve warm. Combine all of the ingredients in a small bowl and whisk smooth. If the glaze appears too thick, add a little more water; if the glaze appears too thin, add a little more sugar. *Soy, coconut, or cow's milk may be used in place of the almond milk. *Canola or vegetable oil may be used in place of the coconut oil. Hummmmmmm!!!! Eu morro de vontade é muito lindo parece uma delicia vou fazer com certeza ! quantos dá para fazer uma receita? 5 stars! My boyfriend is vegan and I have been on the hunt for recipes I can bake him. Up until now everything has been meh, then I made these muffins. SO AMAZING!!! Sweet and really verry fluffy. We both ate them up in one day! Thanks for making me look like a rockstar vegan baker for my man. Can I substitute almond milk with regular & Coconut oil too I mean with vegetable oil. Hi Lama. Yes, I believe those changes should work just fine. Hi Jess. Yes, that is correct! HOLY YUM! What a wonderful trio of flavors in these muffins! So fluffy and tasty! You had me at maple! These look fantastic! Any tips for making this Gluten Free?? I have almond flour, brown rice flour, and flax meal on hand, but im just learning the ropes on gluten free baking. Did you try these gluten free? I want to try too, but don’t want to waste ingredients! These turned out amazing! I added cloves & mace for extra spice, unpasteurized honey and cane syrup to sub the maple syrup. I’ll definitely be making these again. These were fantastic! I used unsweetened coconut milk in place of the almond milk and coconut sugar instead of brown sugar. Tasty indeed! I left off the glaze as they were plenty sweet to me. I totally agree about the bananas – the good ones for cooking are pretty much black. do you think i could sub half the oil for apple sauce so 1/4 oil and 1/4 apple sauce? Hi Ella! I haven’t tried that, so while I’m not 100% sure, I think it could work. You could also try using 1 egg in place of a 1/4 cup of the applesauce. These were delicious and will definitely make this recipe again. I didn’t have applesauce so I substituted with egg. The coconut oil gives it a great flavor. These are delicious! Some of my favorite muffins ever, seriously!! These are super delicious, and there aren’t any hard-to-find weird ingredients. I really appreciate vegan recipes like this. I made them for my family breakfast and they were a hit. Try them with a cup of coffee. Cheers to these muffins! I craved muffins today, so I looked for a vegan recipe, which uses ingredients I have on hand, so I tried yours. I didn’t have pecans, so I used Walnuts instead. I didn’t use as much sugar as you suggested and I still found it to be too sweet. In the future I would only use half a cup of sugar and 1-2 Tbsp of Maple syrup (or Agave since I didn’t have the former). I also only used 1/2 Tsp of cinnamon and less coconut oil. And less nuts (ca 1/4 Cup) but added in chocolate chips ca. 1/4 Cup). Just wondering, if you are using super ripe bananas (which are naturally very sweet) AND Maple Syrup, WHY do you need so much sugar? I would not have thought that you needed any. So happy to hear it, Naomi! These muffins are awesome. I also added a little maple extract. These muffins are so delish & I love that my young daughter can help me measure & mix the ingredients without me worrying she’s going to be messing with raw egg. Seriously I would never guess from the incredible flavor that these were vegan! I can’t wait to try more of your recipes with my girl! This recipe is absolutely delicious! I made it by chance but used buttermilk and butter instead of almond milk and coconut oil. My family fell in love with them. They are my husbands favorite muffins and he doesn’t like banana bread or banana muffins. I started making them for our Airbnb guests as well and everyone comments on them. We had some Vegan guests stay with us so I made the recipe as written and my family didn’t even notice the difference. Lots of guests ask for the recipe and it’s so nice to be able to send them the link to your lovely website. Thanks for sharing! These muffins have me considering going vegan!! Thanks for sharing!!! Hi there! 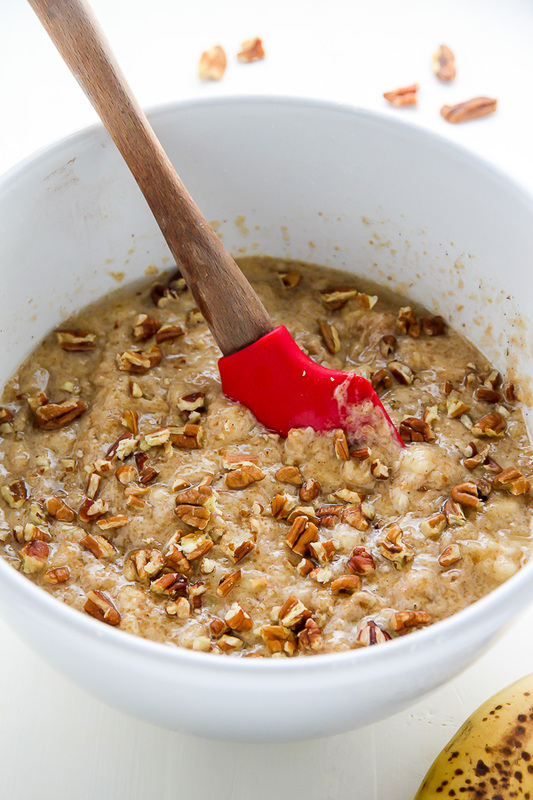 Should the recipe say 1 teaspoon each of turbinado sugar and pecans on top of muffins? Says tablespoon in printed recipe so wanted to double check that. Thank you! These are Absolutely Perfect! 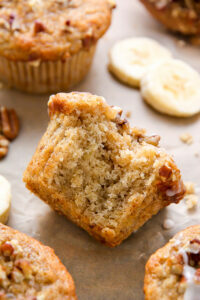 This is my go to recipe for banana muffins now! Thanks so much for sharing. What would you say about using whole spelt flour instead of all purpose wheat flour? Delicious recipe! I used vegetable oil instead of coconut and didn’t have any pecans or walnuts so I omitted the nut altogether. They were a big hit! Is there a way to make this recipe without bananas? Thanks! I have made these twice in the two weeks. They are incredibly moist and are easy to make. The last batch made did not have any nuts in or on them and I used a scant teaspoon of nutmeg. I would highly recommend these to anyone who asks! Thank you for this great recipe!